Cardiac arrhythmias are among the most common cardiac complication encountered during pregnancy. Pregnancy may act as a trigger for exacerbation of pre-existing arrhythmias, whereas some arrhythmias may manifest for the first time. We present a case of new onset ventricular tachycardia in a 30 year old pregnant woman having one previous uneventful full term normal vaginal delivery. Difficulties while administering antiarrhythmic treatment in a pregnant woman and limitations for using diagnostic imaging modalities are discussed. Medical termination of pregnancy was performed to save mothers’ life considering high recurrence rate of ventricular tachycardia (VT). Severe arrhythmias requiring aggressive or invasive therapies are rare. A combination of hormonal, hemodynamic and autonomic changes is a likely cause of arrhythmias in pregnancy. Little data is available on the efficacy or safety of antiarrhythmic drugs in a pregnant woman with arrhythmias. A 30 year old woman married since 5 years gravida 2 para 1 living 1 with 3 months pregnancy presented to the antenatal outpatient department with complaints of palpitation, breathlessness and tremors in the hands for approximately three months. She was apparently well till around 3 months prior when she noticed these symptoms which were sudden in onset. Such episodes used to occur daily, one or two episodes a day and used to last for not more than 15 minutes. However, these symptoms subsided immediately upon taking rest; were not persistent and since it did not interfere with her daily activities, she did not seek any particular treatment for the same. During this time, she also experienced amenorrhea and was confirmed to be pregnant on dip stick testing, following which she experienced emesis, which was however not excessive. At 12 weeks 4 days of gestation by menstrual dates she presented to the outpatient department. On examination, she was stable, afebrile with a blood pressure of 100/70 mm of Hg. There was no pallor, edema or icterus. Abdominal examination was unremarkable and vaginal examination found a soft, pregnant uterus of 12 weeks size with internal os closed. Respiratory and neurological systems were unremarkable. However, the pulse was 136 beats per minute on the radial artery, irregular, with intermittent missed beats, but bilaterally symmetrical and palpable in all peripheral pulses, with no radio femoral delay. Pulse was rechecked after rest. Findings were the same. First differential diagnosis of tachycardia was thyrotoxicosis (due to possible hydatidiform mole) and urgent ultrasonography (USG) was done. However it was suggestive of a single live intrauterine gestation of 12.4 weeks. She was immediately admitted to emergency medical services. 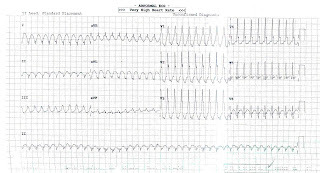 Electrocardiography showed ventricular tachycardia (heart rate of 220 beats per minute), right bundle branch block and atrioventricular dissociation (figure 1). Injection verapamil 50 mg was given intravenously. Tachycardia did not subside, and heart rate remained 220 beats per minute. Repeat dose of injection verapamil was given slowly over 15 minutes intravenously. She developed broad complex tachycardia, blood pressure dropped and became unrecordable and peripheral pulses became feeble. Direct cardio version shock of 200 Joules was given. 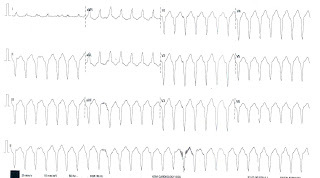 However her persistent tachycardia settled only after 2 repeat shocks one of 200 J, another of 300 J and slow intravenous injection of amiodarone 150 mg. After these intensive measures, she was revived and normal sinus rhythm was achieved. A two-dimensional echocardiography was suggestive of moderate to severe mitral regurgitation and moderate tricuspid regurgitation, moderate pulmonary hypertension, thick and fleshy anterior mitral leaflets and restricted mobility of posterior mitral leaflet. She continued to have monomorphic ventricular tachycardia (figure 2) and was maintained on tablet amiodarone 200 mg and tablet labetalol 200 mg both twice a day. Rheumatology opinion was taken, and it was advised to consider invasive testing (myocardial biopsy) for confirmation of probable sarcoidosis. 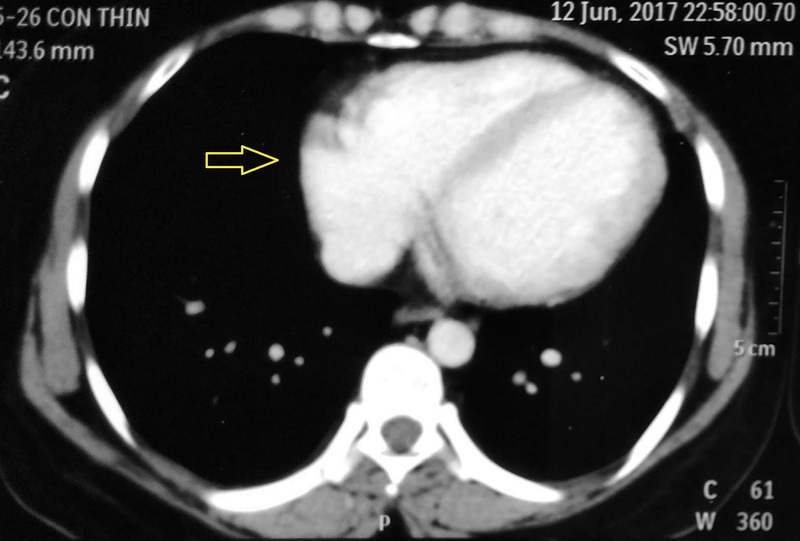 To assess feasibility of myocardial biopsy, contrast enhanced computerized tomography of the chest was done. However, it showed sub-centimeter reactive lymph nodes in pretracheal and prevascular region, largest measuring 5mm. (figure 4) It also showed moderate cardiomegaly with dilated left ventricles and infiltrates. 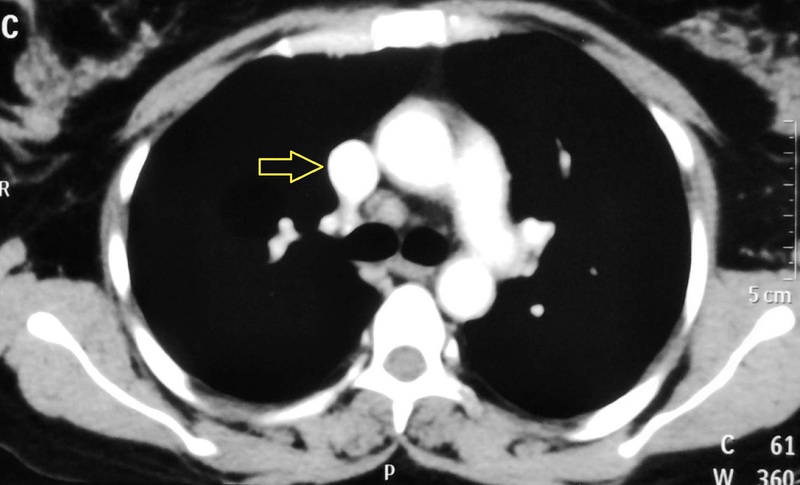 (figure 5) In view of possible difficulty in cardiac biopsy involving sub-centimeter nodes and that the patient was pregnant, the apt diagnostic procedure (which could have confirmed the diagnosis) had to be postponed. In view of this, she was started on immunosuppressant medication (tablet prednisolone 50 mg daily). A medical termination of pregnancy in view of grave risk to the mother was recommended as another episode of ventricular tachycardia could lead to sudden maternal death. After stabilization of the patient and almost a week of no further episodes of decompensation of the patient, due consent was obtained and medical termination of pregnancy was done. Three doses of 400 mcg tablet misoprostol per vaginum 4 hours apart were required for expulsion of a female abortus of 74 grams, after which emergency check curettage was done. She did not develop any further episodes of ventricular tachycardia. She was discharged from the intensive cardiac care unit (ICCU) on tablet amiodarone 200 mg BD, tablet labetalol 200 mg BD, tablet prednisolone 50 mg OD in tapering doses. Mediastinal lymph node biopsy was attempted but in view of extremely small lymph nodes it was not possible and she was discharged on same drugs and was advised to follow up in the event of recurrence of symptoms. “Tachyarrhythmias” refer to non-sustained or sustained forms of tachycardia originating from myocardial foci or re-entrant circuits. The definition of tachycardia are rhythms that produce a ventricular rate > 100 beats per minute. These are possibly explained due to hormonal imbalances of pregnancy, which can predispose to tachyarrythmias. It can also occur in patients with history of congenital heart disease. Our patient had structural heart disease (mitral regurgitation), as confirmed by two dimensional echocardiography. Whether this lesion was a congenital lesion is not clear because no prior medical records were available. However ventricular tachycardia has been reported in pregnant woman without structural heart disease also. Though not clearly explained, it is postulated that abrupt changes in venous return could lead to acute changes in the blood volume predisposing to arrhythmias. Arrhythmias in pregnancies are otherwise uncommon. In a study done by Lee et al, atrial fibrillation was noted in around 60 among 100000 pregnancies. Ventricular fibrillation in general population is estimated to occur at a rate of less than 2 per 100000. Incidence is increased with adolescence and has a male predominance. The intriguing fact about ventricular tachycardia is that majority of the patients die at presentation in the emergency service department. However, our patient was hemodynamically stable at presentation. Very similar to what occurred in our patient, broad complex tachycardia and collapse has been described in pregnancy, but however in late gestation. The common anti-arrhythmic agents used in the first line management of ventricular tachycardias include sotalol, procainamide, amiodarone and verapamil. In this case, verapamil was used. Soon upon administration of verapamil, there occurred hemodynamic collapse. Such a side effect is well documented and was not entirely unexpected. Soon after this, our patient required direct cardioversion. Though concerns regarding fetal arrhythmias and precipitation of preterm labor exist, cardioversion when indicated should be performed with no hesitation, since it is life saving for the mother. Our patient was investigated for cause of ventricular tachycardia and cardiac MRI was suggestive of myocarditis. Myocarditis can be because of viral etiology such as coxsackie virus or immunopathogenesis involving cardiac myosin. These etiologies may be subclinical. Endomyocardial biopsy is mandatory to diagnose the etiology of myocarditis. Myocardial biopsy gives conclusive diagnosis, but was not done in our patient due to her pregnant state. Cardiac MRI in our patient suggested cardiac sarcoidosis. Though FDG- positron emission tomography appears to have better sensitivity than MR imaging, the latter is feasible in pregnancy and suggested the diagnosis. Cardiac sarcoidosis causing ventricular tachycardia is a well established but rare entity. The exact pathogenesis is not clearly understood and though catheter ablation is best treatment, the VT recurrence free survival was only 37% in one year. Because of this high recurrence rate, MTP was advised given the grave risk to physical health of the mother if pregnancy was continued. 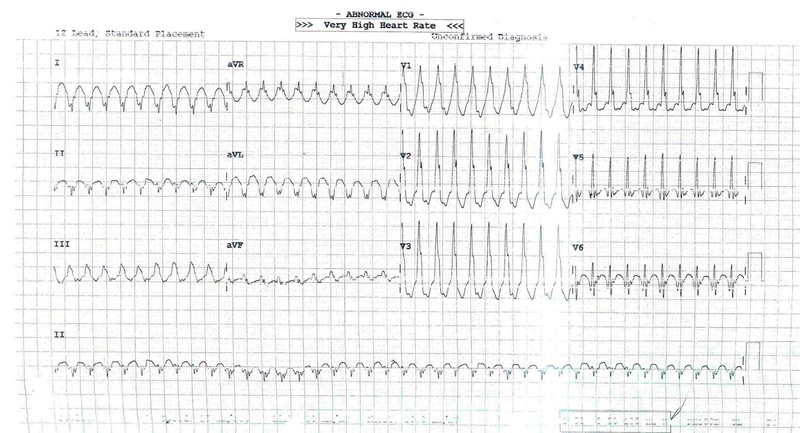 This case is presented to highlight the rare occurrence of ventricular arrhythmia in pregnancy, presentation of ventricular arrhythmia without mortality, successful stabilization of the patient with pharmacological and electrical cardioversion and a medical condition necessitating medical termination of pregnancy. The multidisciplinary management of a high risk pregnancy in a tertiary care set up is highlighted. Marchlinski F. The Tachyarrythmias. In: Longo DL, Fauci AS, Kasper DL, Hauser SL, Jameson JL, Loscalzo J, Eds. Harrison’s Principles of Internal Medicine, 18th ed. New York: Mc Graw Hill 2012; pp.1489. Enderlin EA, Khaled KT, Oke L, Madmani M, Paydak H. Management of tachyarrhythmia during pregnancy. Turk Kardiyol Dern Ars. 2017 Mar; 45(2):189–96. Lee M-S, Chen W, Zhang Z, Duan L, Ng A, Spencer HT, et al. Atrial Fibrillation and Atrial Flutter in Pregnant Women—A Population‐Based Study. J Am Heart Assoc. 2016; 5(4):e003182. Tseng WC, Wu MH, Chen HC, Kao FY, Huang SK. Ventricular Fibrillation in a General Population - A National Database Study. Circ J. 2016; 80(11):2310–6. Sengupta A, Slater TA, Sainsbury PA. 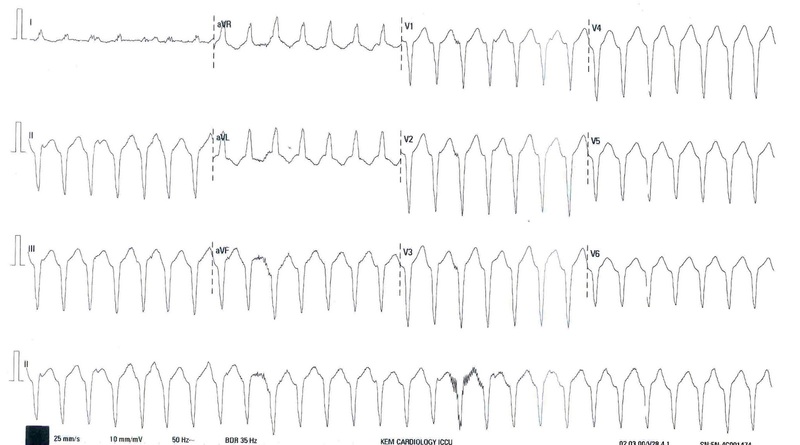 The investigation and management of broad complex tachycardia and ventricular standstill presenting in pregnancy: A case report. Obstet Med. 2014; 7(3):131–4. Vianna FSZ, Schuler-Faccini L, Weber-Schondorfer. Heart and Blood medicaitons. In: Schaefer C, Peters PWJ, Miller RK, eds. Drugs During Pregnancy and Lactation. Treatment Options and Risk assessment. 3rd edition. Amsterdam: Elsevier 2015; Pg 211. Rose NR. Viral myocarditis. Curr Opin Rheumatol. 2016; 28(4):383-9. Sharma S. Cardiac imaging in myocardial sarcoidosis and other cardiomyopathies. Curr Opin Pulm Med. 2009; 15(5):507–12. Kumar S, Barbhaiya C, Nagashima K, Choi EK, Epstein LM, John RM, et al.Ventricular tachycardia in cardiac sarcoidosis: characterization of ventricular substrate and outcomes of catheter ablation. Circ Arrhythm Electrophysiol. 2015;8(1):87-93.